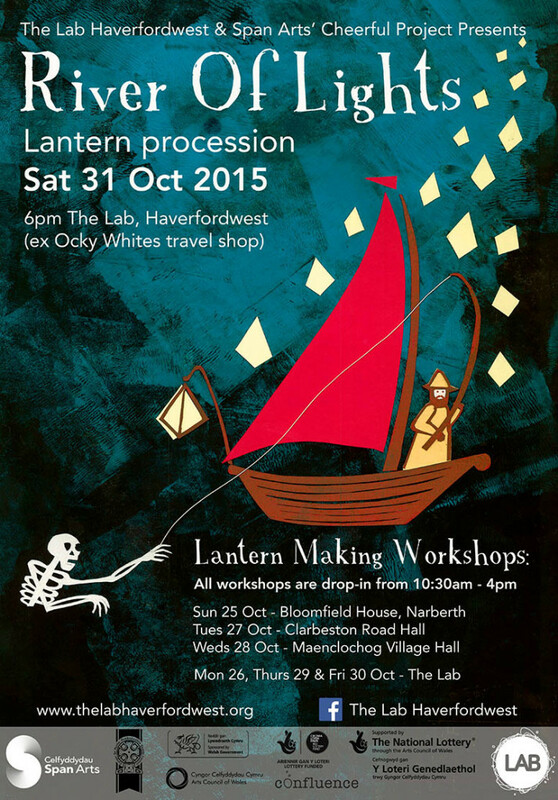 The River of Lights lantern parade took place on Saturday 31 October 2015 from 6pm at the Lab. Taking the story of the Skeleton Woman and the Fisherman as its starting point, River of Lights used the river Cleddau as the backdrop and inspiration for a spectacular lantern procession celebrating the county town and its connections with the rural hinterlands. Hundreds of lanterns made by schools, community groups and in open workshops in Haverfordwest, Maenclochog, Clarbeston Road and Narberth came together to create a magical candle-lit lantern procession along the river, culminating in a spectacular fire drawing at Fortune’s Frolic. River of Lights is a partnership between the Lab Haverfordwest, Span Arts Cheerful Project and lead artist Toby Downing.